Brandnew Folio is a two column blogger template with sidebar to its right and post section to left.The design is simple and looks very nice.Top menu links are ready for you.Rss button is also ready in the blog.Search bar also ready at top of blog.Design is simple and cool and will like for sure.Seo for title has been done in template.I hope you will like the template for sure.Template support full blogger features.For any support you can comment on this post. 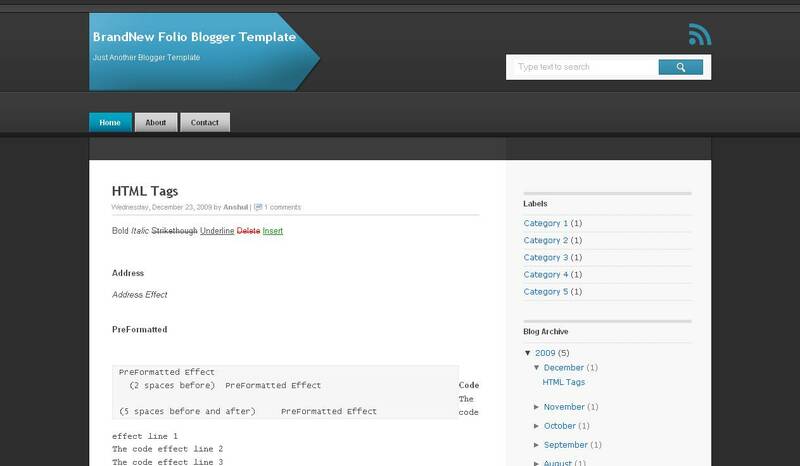 Other blogger templates you may like are Mild Cotton and GreyMagic. It seems the featured post section is not showing up for me, do i need any pluggins? Thanks. @cristian which featured section u saying as in above template there is no section like this.